BREEAM ‘VERY GOOD’ Certified Building. Lettable areas from 110 – 800 m2 on a one floor. Space efficient floor plates and common areas. 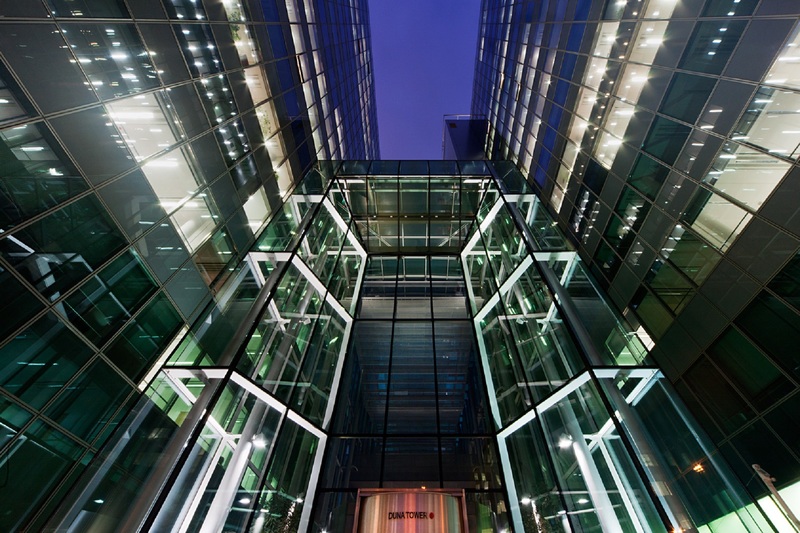 Elegant, modern and bright, tall entrance lobby, reception area with glass ceilings. Huge glazed façade surface (more than 75% of the total surface). 24 hour concierge / receptionist. Turnstiles to ground floor entrances. Card access control and CCTV monitoring to all entrances. 3 elevator cores with 4+4+2 modern elevators in each to ensure short waiting times. 4 elevators go to the basement parking levels. Several bicycle storage facilities in the basement. Modern Building Management System which monitors and controls all aspects of the property. app. 382 underground and 31 surface parking spaces with 24 hour security controlled access. App. 960 m2 of storage. Regular and handicapped toilet on the ground floor. ATM and bank office on the ground floor. On site recycling, water saving fixtures, daylight sensors to common areas. 2.80 m clear internal height for office spaces, 2,40 m for corridors and toilet blocks, storage. Suspended ceilings with integrated light fittings delivering 500 lux. Raised floor and floor boxes to allow maximum flexibility. BMS centrally controlled internal temperature with individual control of room temperature by thermostat. Distance heating and chilled beams with minimal noise emission for cooling. Openable windows, app. 40% of all windows. All façade windows are equipped with internal, electric engine driven shutters. All areas are protected by fire and smoke detectors and automatic water sprinkler system.